Tonight I bottled my altbier. “Alt” means old and that is relative to lager, the “new” style. Alt is a North German beer, originating in Düsseldorf. It, along with Kölsch, is one of the few remaining German ale styles. An altbier is amber to brown with more hop flavor and bitterness than any other German style. There is still a balance between malt and hops, though. Fruity character from the ale yeast is present, but it is relatively clean and crisp due to extended aging. I made mine a dopplesticke. In German “doppel” means double and “sticke” means secret, as in a secret recipe. This is the strongest altbier a brewery makes. It should be strong and sweet but also quite bitter. It is usually dry hopped as well. When I opened the fermenter I noticed a layer of something growing on top. I’m pretty sure it’s not mold. Here’s what I think happened. On the day I transferred the alt to the fermenter to age in, I was also working on my Oud Bruin. Description of that project in full will have to wait for another post, but suffice it to say I am aging that one with Brett, which tends to form a pellicle. I must have gotten just a little cross contamination, enough for the Brett to build up a bit in the almost two months this alt’s been lagering. Anyway it still tastes great so I’m bottling it and hoping for the best. Recipe below. The immortal words of Charlie Papazian, to all homebrewers nervous about that next batch: “Relax. Don’t Worry. Have a Homebrew.” In that spirit I will try one of the last bottles of my last batch, Flood Water Bitter. I brewed this way back on June 14, the first day the Iowa River flooded over the bridge to my house. It pours a very hazy mahogany with a creamy tan head. There is a light fruity nose, some caramel, and a little metallic tinge. The flavor at first seems sweet, then quickly dry and a strongly bitter. A spicy, slightly earthy hop flavor is present throughout. Flavors and bitterness linger. I have a couple bottles left so let me know if you want one. I wasn’t lazy and so I did a double decoction mash. The original gravity was 1.068 and the final gravity 1.008, making the alcohol about 8%. 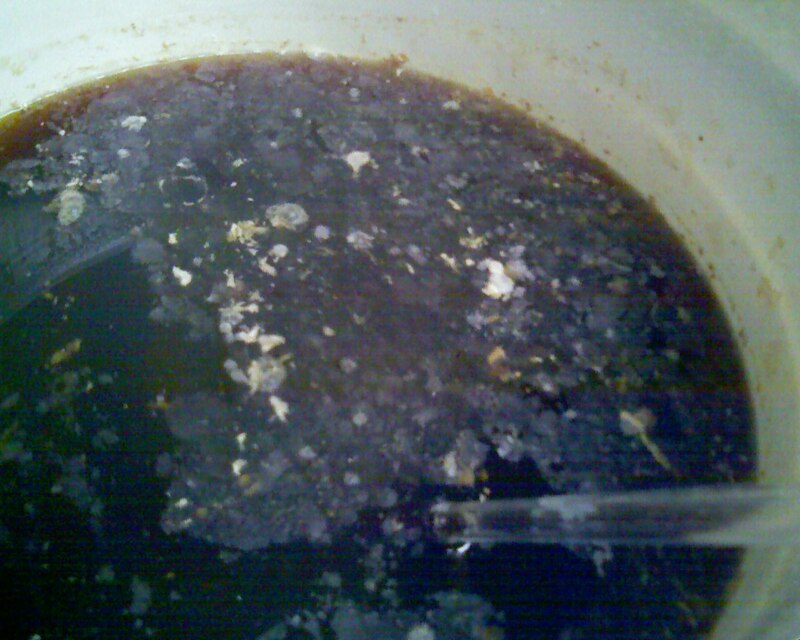 This entry was posted on Saturday, October 25th, 2008 at 0:03	and is filed under Homebrew, Strong Beer. You can follow any responses to this entry through the RSS 2.0 feed. You can leave a response, or trackback from your own site. yum! i just had a bottle of your dopplesticke and loved it! i took a few opening sips, then continued drinking it with some asiago (which worked really well! ), some parmesan (which worked okay) and finally with spicy chili. i thought the malt flavor was particularly delightful.